Ah, the things we learn about our lenses — even with my 55-200, I can be too close to get sharp focus! The only problem is that there’s very little room for mistakes. It’s only a 12-foot deck … so I have to be careful. 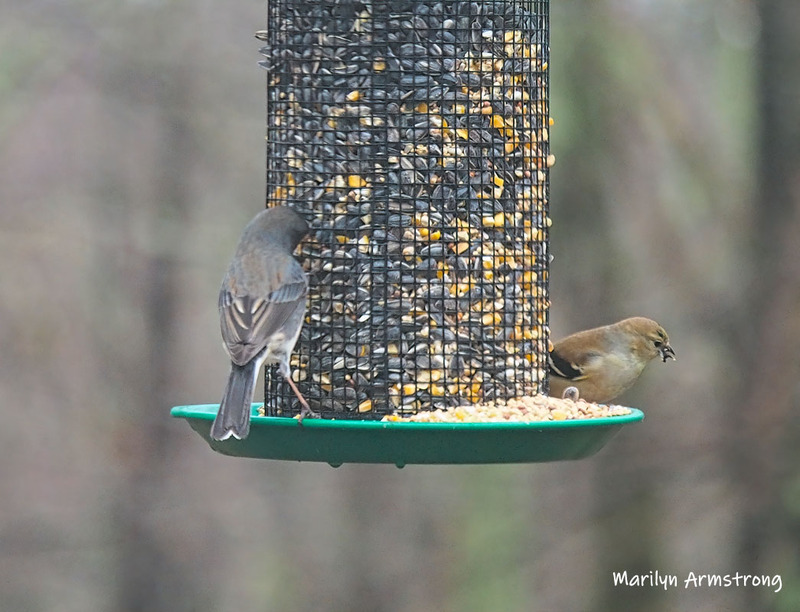 When they all start to go for the big feeder, it really IS a party. 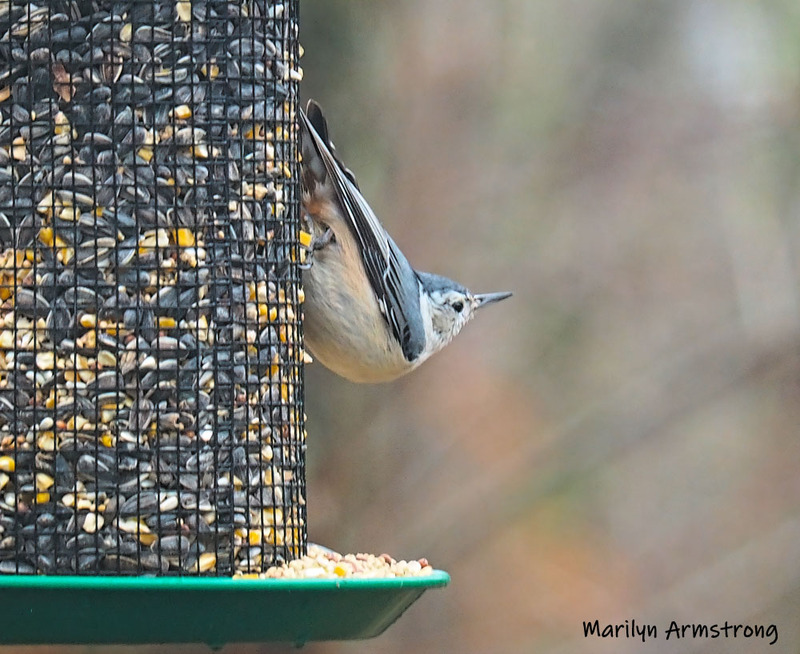 Pretty funny as they knock each other off the feeder. How big are woodpeckers, Marilyn? In comparison to finches for example. I always imagined that they were larger but I have never seen one as we don’t have them or if we do not the same ones. 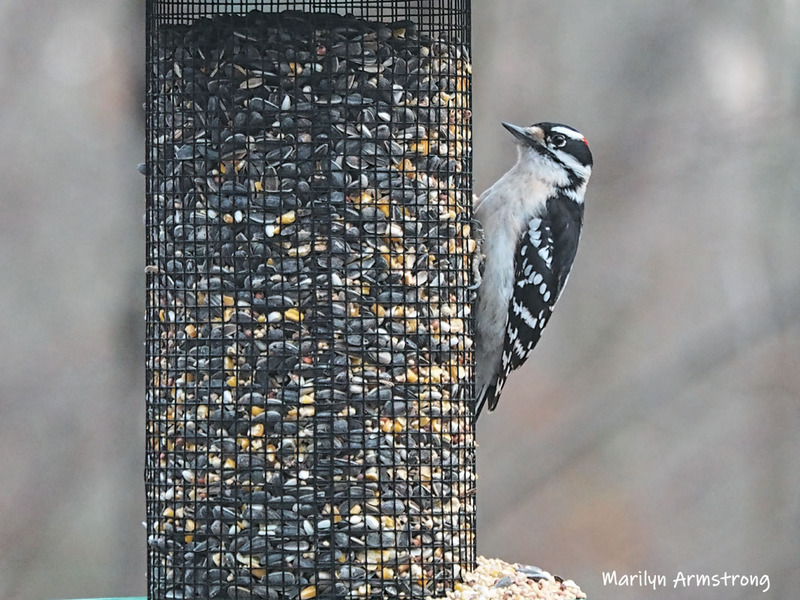 THESE downy woodpeckers are the smallest of the woodpeckers, so they are maybe the size of a thrush or robin? About 6 to 8 inches long. 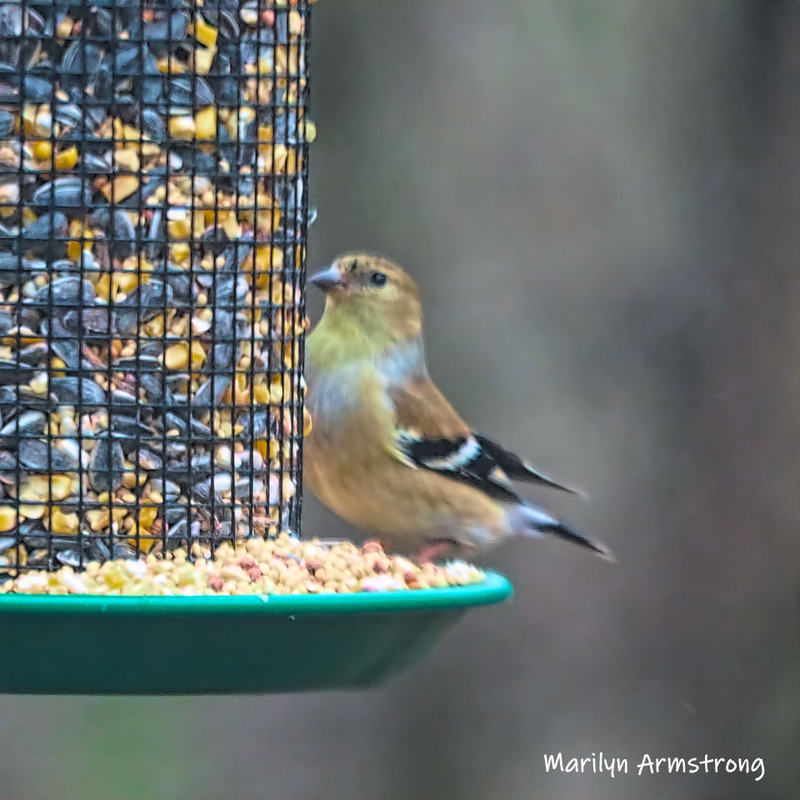 Finches are about half that size. Does that help? 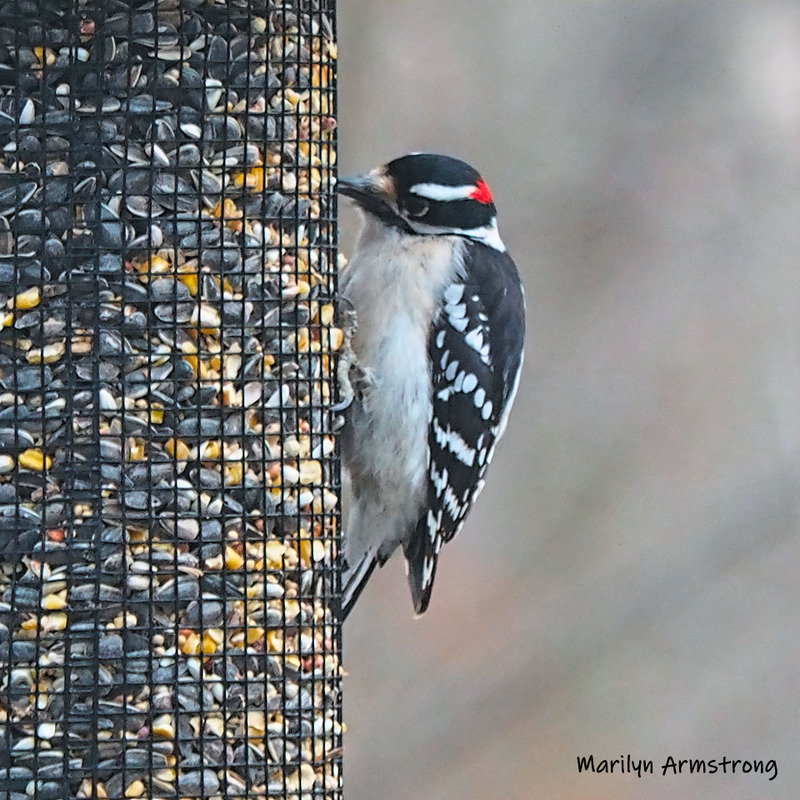 Hairy Woodpeckers which are identical to the Downy Woodpeckers are about an inch or two longer and fatter … and THEN there are the Ladderback bunch, which are about the same size as the Hairy Woodpecker, but a very different shaped bird. But there’s the Pileated Woodpecker who is not a “feeder” bird so he doesn’t come close to the house, though I’ve seen him in the woods. He’s the size of a falcon … quite a sizeable bird. You don’t see them much, but you can hear them punching holes in the oak trees throughout the summer. Yes that does help. We have robins although they are different from the European ones. Naomi gave me a book about Tasmanian birds for a welcome home present so I will enjoy trying to identify birds I see in my garden or round the district. 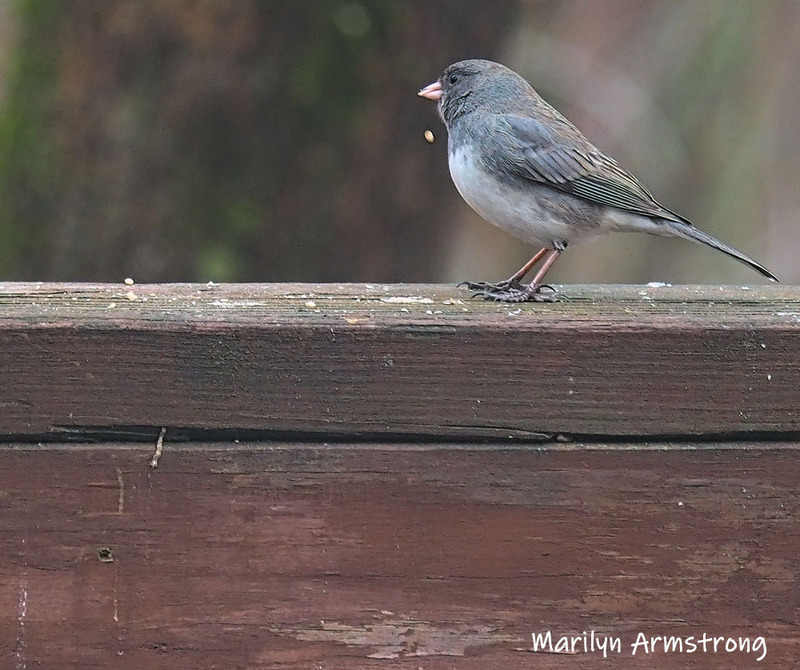 Beautiful photos and birds Marilyn! I also share your pain with the zoom focus, although more often with flowers than bird shots – i have to content myself with a wider frame and cropping the image to give the size i wanted. Changing to aperture or shutter priority settings made next to no difference. I have an actual macro lens too. It’s just I tend to use whatever happens to be ON the camera and rarely change lenses. I hate changing lenses so when I’m “out and about” I use my “do it all” camera … but while it will shoot pretty close, it won’t shoot like a macro shoots which is ultra close. I might have to give in an actually change lenses sometimes. Gads. Talking about birds, Marilyn, I saw a flock of geese heading north today….could that be? or are they all mixed up?